Last Fall (2011) I purchased a Cold Cold World Ozone backpack. The Ozone's simple design and durable ballistics nylon fabric make it the perfect guide's pack for rock climbing. With no external straps, no spindrift collar, and a stiff foam backpad it packs and unpacks easily and carries well between routes and climbs well on routes. To my surprise, the Ozone ended up being a great winter pack too. For most moderate ice objectives the tools and crampons, plus my kit of 6-8 screws, lightweight puffy, water and a small thermos all fit inside. The pack worked as well for winter cragging as it did for summer cragging. Placing the tools inside the pack frequently confused my partners but also meant easy hiking through thick brush, no chance of a lost tool or crampon and no worries while taking the pack in and out of cars or houses. I've done a number on more than a few car bumpers and walls trying to sneak packs into small spaces only to leave a big scratch. Having the sharp stuff inside, which never occurred to me before having this bag, makes good sense. After only a few weeks using the bag I noticed some things. The stock 18.5” torso length on the Ozone is a good length for individuals that are under 6' tall. The bag carries fine because it's small, packs well and rides close to one's back, but if you want the waistbelt to ride on your waist for carrying heavier loads you'll want the torso length customized for your back. The other thing I noticed is that this design has extreme potential for 2-3 day alpine routes and longer days on alpine ice routes. Having the option to carry a picket or ax externally in the mountains for a bit more internal carrying capacity made sense. This spring I contacted Randy Rackliff, who makes Cold Cold World packs, about making me an Ozone pack with a longer torso, a floating/removable lid, a spindrift collar, and external ax loops. We discussed other options and the potential for making a similar yet slightly larger pack. The time needed to construct a new pattern for a bigger pack was prohibitively costly. When all was said and done I had also decided to have the new pack made with 500D Spectra grid fabric, which is essentially half the weight of the ballistics nylon but still durable enough for heavy use. I eagerly awaited the arrival of my new pack, which took only one day to ship from Jackson, New Hampshire to my home in western Massachusetts. A new Cold Cold World pack is a thing of beauty. The design is simple and the construction is flawless. There are no loose threads, no missed stitches and each fabric panel fits perfectly with all the others. Little details stand out too – the inside is yellow so that it's not so dark while you digging for small items deep within the pack, and the haul loop and rope strap are red, which stands out and looks nice too. Even the shoulder strap length was adjusted for someone with a longer torso. I was feeling hesitant about using this beautiful lightweight bag. Really, not use it? No way. I took it out for a spin at the crag the other day and many of my feelings about the bag were confirmed. It's the nicest pack I've ever owned and the timeless, no-frills design is exactly what most climbers need year-round. 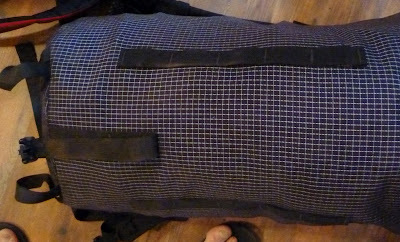 There's nothing extraneous on this bag and it's going to work equally well at the local crag and in the Cascades and Alaska on big alpine routes. The 2” longer torso length makes the webbing hip belt ride perfectly on my waist and increases the carrying capacity of this pack enough to make it useful as more than just a crag pack. The floating lid and spindrift collar will help with this too. At the crag I can now carry more than just a single rack comfortably, without overstuffing the pack. potential volume of the new Ozone. 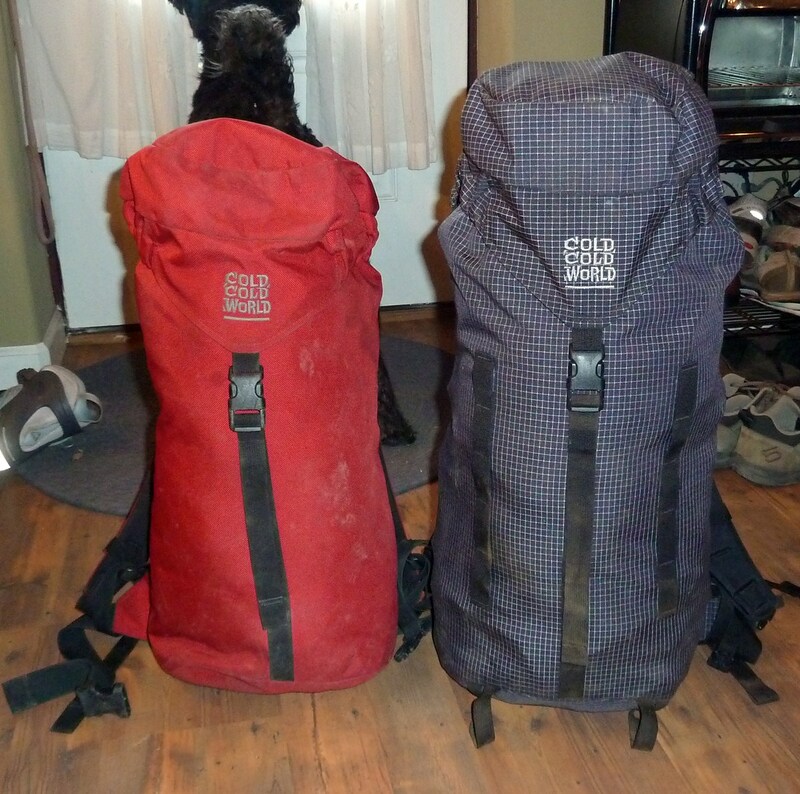 This summer I'll be able to take the same pack on multiday guiding trips in the Cascades. A BD Firstlight, Big Agnes Aircore pad, and Mountain Hardwear Phantom 32 will all fit inside along with a small climbing kit plus a jetboil. Unless you're really counting grams, Ballistics nylon is the way to go for durability. The weight difference, when compared with most clunky modern packs, is neglible. Decide whether you want the pack's hipbelt to ride above your waist (like a BD Bullet or Hollowpoint) or like a real load carrying pack, on your hips. This will determine carrying capacity and torso length. If the bag is a crag only pack consider omitting the spindrift collar, which can make repeated packing and unpacking challenging. I have one friend who cuts the collar out of most of his bags. 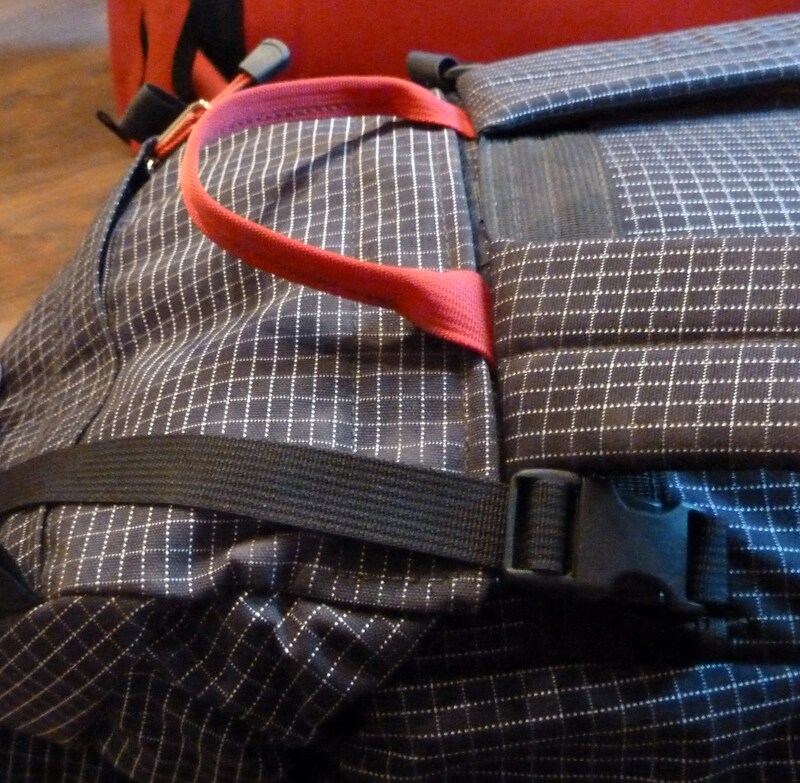 .If the bag is a crag pack, omitting the external ax loops would be fine. The tools will fit inside handily. The floating/removable lid is nice even if you don't have a spindrift collar. 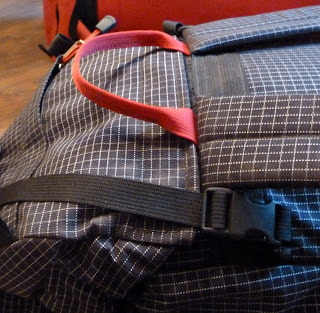 Then, while climbing with the bag the lid can be placed inside the pack, which is largely empty now that you're carrying all of your kit on your body. All these comments aside, I'll probably stick with my current design even though the spindrift collar makes packing a tiny bit more challenging. At some point I'm going to get a Ballistics nylon version for hard, everyday crag use. This bag, and many of the modifications are based largely on recommendations from Dane Burn's fantastic blog Coldthistle. If you're even more curious about packs head over there and have a look. 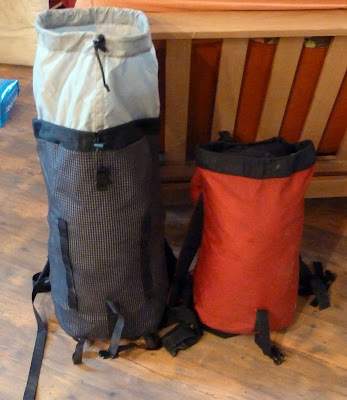 He just finished writing a series of three posts about pack design and construction, components an alpine pack should(n't) include and how to fit packs properly.